Everything should be maintained properly. Just like that, Computer should also be maintained properly. Even systems with powerful hardware configuration might slowdown, if it was not maintained well. Are you frustrated because of slow computer? Searching for computer technician to speed up your computer? Then follow the below working tips to speed up windows computer. These Tips to Speed Up Windows Computer can be followed up on all version of Windows including Windows XP, 7, 8 and 10. Uninstall unwanted Programs: Even if you are not using the application, it will use the system resources in background which will slow down the system. Remove all the unwanted and unused programs installed on your computer. Update Windows: Windows 7, 8 and 10 will get often updates which improve and fix performance, fix security issues and upgrade drivers of your system. On left sidebar, click Change settings. In the important updates dropdown, choose install updates automatically (recommended). Note: Microsoft stops providing updates to Windows XP, so if you are still using Windows XP, upgrade to Windows 7, 8 or 10. Update Software: Same like windows, even all the installed software will often get updates to fix security issues and performance upgrade. Enable Auto Update on all your applications. Clean internally: Every program uninstalled from the system might leave some temporary files and garbage in installed folders and registry respectively. Application, browser, utilities and operating system might keep some temporary unused junk files which might slowdown the system and browsing speed. Run Antivirus: Are you using the external drives or your system connected with an internet? Then you may have chances to get virus or malware. Malware are suspicious programs which can corrupt system files, slowdown the system, hack your personal data, etc. Download and install the trusted free antivirus programs such as Avast, Avira and AVG. Schedule the antivirus application to scan the full computer atleast by weekly once and remove or quarantine all the detected malware and virus. Upgrade Hardware components: Both the software and the hardware of the computer should be optimized to increase the performance of the system. Upgrade your system’s RAM and processor which provides 50X high increase in performance. Choose High Quality Software: Installing pirated or low quality software will result in hanging or crashing of the operating system. Choose only the best and high quality software and always download software only from their official website. Maintain Hard drive: Hard drive of your system must be well optimized to boost the speed of file and folder navigation. Try to keep atleast 10GB free space in each hard drive. Monthly once defragment all the hard drives of your computer. 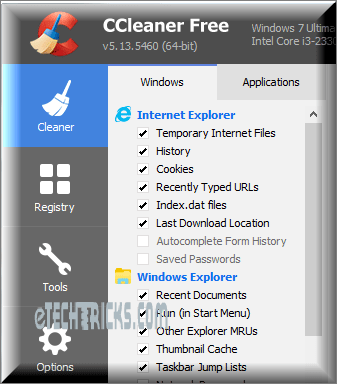 CCleaner: CCleaner is the No#1 tool which cleans all the browsing cookies, caches, system logs, application junks, etc. It cleans your registry error and optimize your system which boost overall performance of your computer. Download CCleaner from piriform and install into the system. I agree CCleaner is the best ever all-in-one tool to speed up the computer. I using this more more than 4 years. Reduces all the manual efforts to clean.